Glen Mhor (pronounced Glen Vawr, meaning Great Glen…) was initiated in 1892 by John Birnie and James Mackinlay of Charles Mackinlay & Co, the blenders from Leith. 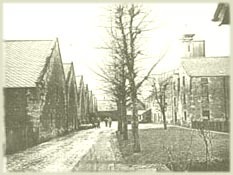 Birnie had left the Glen Albyn distillery two years earlier after a dispute about shares in the distillery. Next to Glen Albyn, he and Mackinlay started the Glen Mhor distillery and were distilling from 1894 onwards. Little is known about the equipment but there’s no doubt in my mind Birnie constructed his distillery to the same technical advanced standards as he did with Glen Albyn. History of Glen Mhor seems to be quite dull most of the times. The acquisition of Glen Albyn and the Saladin box being the two outstanding events of its history. These days we can make things a little bit more exciting. I strongly suggest you do a H2H between Glen Mhor and Glen Albyn. Diageo has an excellent Glen Mhor 22yo 1979/2001 and an evenly excellent Glen Albyn 26yo 1975/2002 in their Rare Malts range. Try to track them down and plunge yourself in some Merkinch District history.